When it comes to a trusted name in the commercial roofing industry, Firestone is second to none. From small commercial projects to major roof replacements, Firestone offers the materials you need to wind up with a roof you can count on for superior protection. In fact, Firestone has been a recognized world leader in building products for over 100 years. That’s a reputation you can trust. If you have a major commercial roofing project coming up, consider Firestone for your materials. Here at Sorensen Roofing & Exteriors, our team of Greeley roofing contractors are proud to install the quality commercial roofing products engineered by Firestone. Call our team at (970) 344-4337 to learn more about Firestone commercial roofing products and request a free estimate from our team. Commercial roofing projects are a major undertaking. Due to the unique nature of most commercial roofs, these are not one-size-fits-all projects. Installing a new commercial roof requires careful attention to detail and the implementation of the ideal materials based on specific needs. Here at Sorensen Roofing & Exteriors, we understand how critical it is for your next commercial roofing project to go off without a hitch. That is why we are proud to offer an array of roofing choices from Firestone. From the initial stages of deciding on the right material for your needs and budget to the final day of installation, our team is equipped with the right knowledge and experience to handle a roofing project of any size. If you are looking to install a new commercial roof, consider one of the many Firestone products we carry. Contact us today for a free estimate. When it comes to a strong and durable roofing material, Firestone’s Thermoplastic polyolefin (TPO) roofing membrane is an excellent choice. These single-ply roofing membranes are an ideal choice for large commercial buildings that need to improve energy costs. The highly reflective nature of TPO means less money is spent on cooling a large building during summertime heat. Beyond just being a sound choice for those looking to improve energy costs, TPO delivers outstanding protection against the elements. If you need a new roof for your commercial building, consider implementing this outstanding roofing membrane. For a roof that is tough and capable of handling whatever the local weather throws its way, RubberGard™ EPDM by Firestone is an excellent choice. This high-quality roofing material is designed utilizing synthetic rubber compounds. This makes it a durable and flexible roofing membrane, offering protection for an array of building types. From large warehouses to office buildings, RubberGard™ stands tough against whatever mother nature brings. Consider investing in an EPDM roof for your commercial building. At Sorensen Roofing & Exteriors, we are proud to provide durable commercial roofing products from Firestone. From repairing a single section of a commercial roof to a complete overhaul, Firestone provides an array of materials that will provide outstanding protection moving forward. Whether your business hopes to lower your energy costs or you want better protection against the harsh Colorado and Wyoming climate, we can work with you to find the perfect Firestone roofing products for your needs. 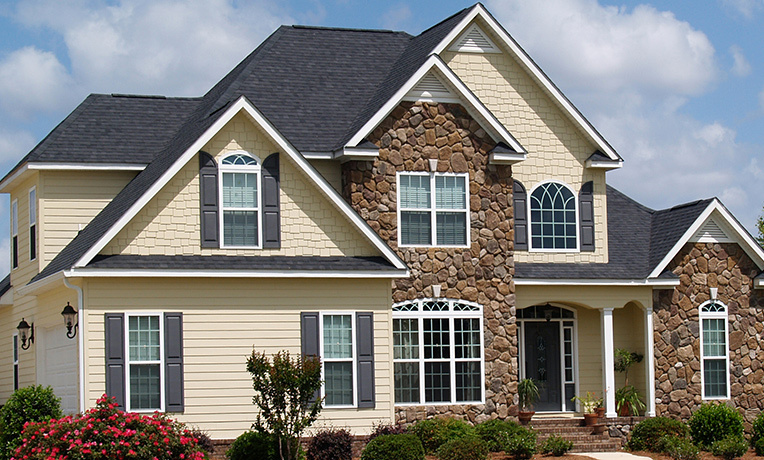 Not only will you enjoy the benefits of the superior materials offered by Firestone, but you will also be benefitted by working with our talented team of Greeley roofing contractors. With years of experience under our belt, working on projects big and small, we can ensure that your commercial building is given the protection it needs. Talk to us to learn more about utilizing Firestone roofing products for your commercial building and request a free estimate on services today. Sorensen Roofing & Exteriors and GAF have worked together for years to provide homeowners in Colorado and Wyoming with the very best roofing materials and roof replacements. Whether you choose the popular Timberline, the timeless Sienna, or the virtually indestructible Armorshield, you’ll have peace of mind knowing you chose the best roofing products and roofing team for the job.